In 1967, the world was introduced to a new virus: thirty-one people in Marburg and Frankfurt in Germany, and Belgrade in the then Yugoslavia, became infected in a linked outbreak with a novel haemorrhagic fever agent. Twenty-five of them were laboratory workers associated with research centres, and were directly infected via contact with infected vervet monkeys (Chlorocebus aethiops) imported to all three centres from Uganda. Seven people died. In what what was a remarkably short period of time for that era – given that this was pre-sequencing and cloning of nucleic acids, let alone viruses – it took less than three months for scientists from Marburg and Hamburg to isolate and characterise what was being called “green monkey virus” virus. The new agent was named Marburg virus (MARV), after the city with the greatest number of cases. The first electron micrograph of the virus clearly exhibits the filamentous nature of the particles, complete with the now-famous “shepherd’s crook”. The virus disappeared until 1975, when an Australian hitchhiker who had travelled through what is now Zimbabwe was hospitalised in Johannesburg, South Africa, with symptoms reminiscent of Marburg disease. He died, and his female companion and then a nurse also became infected with what was suspected to be yellow fever or Lassa viruses. In an example for later outbreaks, this led to rapid implementation of strict barrier nursing and isolation of the patients and their contacts, which resulted in quick containment of the outbreak – with recovery of the two secondary cases. MARV was later identified in all three patients. 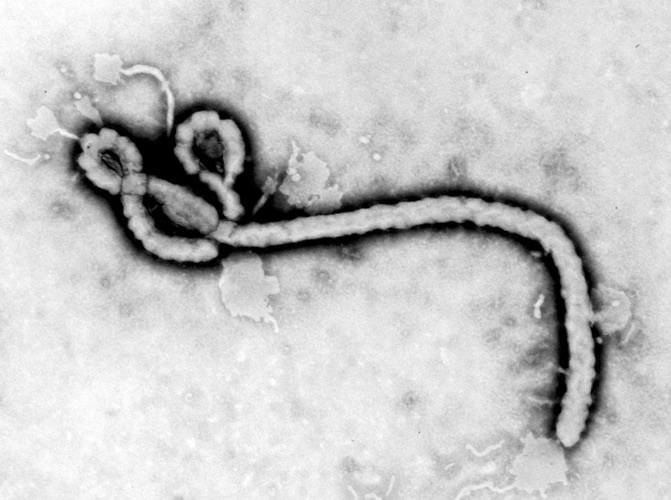 Ebola viruses burst from obscurity in 1976, with two spectacular outbreaks of severe haemorrhagic fever in people – both in Africa. In the better-known outbreak for which the viruses were later named, Ebola virus (EBOV) was first associated with an outbreak that eventually totalled 318 cases, starting in September 1976. This was in the Bumba Zone of the Equateur Region in the north of what was then Zaire, and is now the Democratic Republic of the Congo (DRC). The index case in the outbreak, as well as many of those subsequently infected, was treated in the Yambuku Mission Hospital. He was injected with chloroquine to treat his presumptive malaria: within a few days fever symptoms developed again; within a week, several others who had received injections around the same time also developed fevers which in several cases had haemorrhagic complications. Interestingly, women 15-29 years of age were most affected by the disease: this was strongly correlated with their attending antenatal clinics at the hospital, where they regularly received injections. Apparently the hospital had only five old-style syringes and needles, and these were reused without proper sterilisation. Nearly all cases in this outbreak either received injections at the hospital, or had close contact with those who had. Most people were infected within the first four weeks of the outbreak, after which the hospital was closed because 11 of 17 staff had died. Another 269 people died, for a total estimated case-fatality rate of 88%. The incubation period for needle- transmitted Ebola virus was 5 to 7 days and that for person to person transmitted disease was 6 to 12 days. Interestingly, in post-epidemic serosurveys in DRC, antibody prevalence to the “Zaire Ebola virus” has been 3 to 7%: this indicates that subclinical infections with the disease agent may well be reasonably common. The team that discovered the virus at the Antwerp Institute of Tropical Medicine in Belgium, did so after receiving blood samples in September 1976 from a sick Belgian nun with haemorrhagic symptoms who had been evacuated from Yambuku to Kinshasa in the DRC, for them to investigate a possible diagnosis of yellow fever. Following her death, liver biopsy samples were also shipped to Antwerp – where the team had already ruled out yellow fever and Lassa fever. Because of the severe nature of the disease, and its apparently novel agent, the World Health Organisation (WHO) arranged that samples be sent to other reference centres for haemorrhagic viruses, including the Centres for Disease Control (CDC) in Atlanta, USA. The Belgian team were the first to image the virus derived from cell cultures on an electron microscope – when it was obvious that the only thing it resembled was Marburg virus. The CDC quickly confirmed that it was Marburg-like, with possibly the most famous virus image in the world, but that it was a distinct and new virus. This meant it needed a name – and it was given one derived from the Ebola River that was supposed to be near the town of Yambuku. Another, minor outbreak of the virus occurred in June 1997 in Tandala in north-western DRC: one young child died, and virus was recovered from her – and subsequent investigations showed that “two previous clinical infections with Ebola virus had occurred in 1972 and that about 7% of the residents had immunofluorescent antibodies to the virus”. This further reinforced the idea that subclinical infections were possible. In June 1976 – before the Yambuku epidemic in DRC – an outbreak of a haemorrhagic fever began in the southern Sudanese town of Nzara. The presumed index case was a storekeeper in a cotton factory, who was hospitalised on June 30th, and died within a week. There were a total of 284 cases in this outbreak: there were 67 in Nzara, where it is presumed to have originated, and where infection spread from factory workers to their familes. There were also 213 in Maridi, a few hours drive away – where, as in Yambuku, the outbreak was amplified by “nosocomial” or hospital-acquired transmission in a large hospital. In this case, transmission seems to have been associated with nursing of patients. The incubation period in this outbreak was 7 – 14 days, with a case mortality rate of 53%. Two viral isolates were made from sera from Maridi hospital patients in November 1976. Antibodies to the now-identified “Ebola virus” from DRC were detected in 42 of 48 patients clinically-diagnosed patients from Maridi – but in only 6 of 31 patients from Nzara. However, it was subsequently shown that the Sudan and DRC Ebola viruses were different enough from one another to be separate viral species (see later), which undoubtedly affected the results. Interestingly, 19% of the Maridi case contacts had antibodies to the virus – with very few of them with any history of illness. This strongly indicates that the Sudan virus can cause mild or even subclinical infections. An indication of the possible origin of the epidemic is the fact that 37% of the workers in the Nzara cotton factory appeared to have been infected, with 6 independently-acquired infections – and that this was concentrated in the cloth room, where there were numerous rats as well as thousands of insectivorous bats in the roof. However, subsequent study of antibodies in the bats failed to detect evidence of infection, and no virus was isolated from bat tissue. There was another outbreak of the same type of Ebola haemorrhagic fever in the area of Nzara in July – October 1979: this resulted in 34 cases, 22 of them fatal, with the index patient working at the cotton factory and all others being infected via the hospital he was admitted to. It is interesting that antibodies to the Sudan virus were detected in 18% of adults not associated with the outbreak, leading the report’s authors to speculate that the virus was endemic in this region. It was thought that the Sudan and DRC outbreaks were linked: the original WHO Bulletin report on the Sudan outbreak even speculates that extensive truck-borne commercial goods traffic between Bumba in DRC and Nzara in what is now South Sudan could have caused the DRC outbreak. However, comparisons between the viruses isolated from the two epidemics later showed that they were distinct, both in terms of virulence, and antigenicity – meaning the Sudan virus got its own name. Epidemics and outbreaks have resulted from person to person transmission, nosocomial or in-hospital spread, or laboratory infections. The mode of primary infection and the natural ecology of these viruses are unknown. Association with bats has been implicated directly in at least 2 episodes when individuals entered the same bat-filled cave in Eastern Kenya. Ebola infections in Sudan in 1976 and 1979 occurred in workers of a cotton factory containing thousands of bats in the roof. However, in all early instances, study of antibody in bats failed to detect evidence of infection, and no virus was isolated form bat tissue. This entry was posted on 10 March, 2015 at 13:26 and is filed under biotechnology, Ebola, Ebola, Evolution, General Virology, history, Vaccines: General, Viruses. You can follow any responses to this entry through the RSS 2.0 feed. You can leave a response, or trackback from your own site.